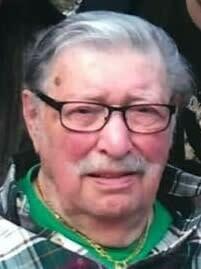 Nicholas P. Papalambro, age 94, of Paramus, NJ passed away on Sunday, November 18, 2018. Born in New York City and raised in Rego Park, Queens, he resided in Fort Lee before moving to Paramus 62 years ago. Nicholas proudly served with the U.S. Army during World War II. He was a member of the Masonic Lodge of New York City. A true handyman, he enjoyed gardening, hunting but especially spending time with his family who he loved immensely. Prior to retiring, he was a stationary engineer with Novartis in Suffern, NY for many years. Beloved husband of Angela (Kantzos) Papalambro. Loving and devoted father of Constance Calandrino and husband Anthony, Stacey Ford and husband Christopher, Penny Paulicelli and husband Michael, Amy Rizzitello and husband Dario and Valerie Papalambro. Cherished grandfather of Jeremy Calandrino and wife Omoyele, Nicholas Calandrino and wife Tessa, Alexis Tonda and husband Jonathan, Matthew Ford, Maegan Ford and fiancé Kevin, Melissa Ford, Michael Paulicelli, Jr. and partner Jacquie, Nicole Paulicelli and fiancé Lenny, Phillip Paulicelli, Julianne Rizzitello, Jonathan Rizzitello and wife Melissa, Joseph and Justine Rizzitello and Andrew, Christopher, Lucas and Nicholas Nelson. Adored great-grandfather of Benedict, Dominick, Madeline, Alexander, Jackson, Cameron, Caylee, Benjamin and Kiera. Dear brother of the late Sam Papalambro and Barbara Demetriou. The family will receive relatives and friends Monday, November 19, 2018, 7-9 pm and Tuesday, November 20, 2018, 2-4 & 7-9 pm at Vander Plaat-Caggiano Funeral Home, 13-31 Saddle River Road, Fair Lawn, NJ. Trisagion Monday 7:30 pm. A funeral service is planned for Wednesday, November 21, 2018, 12:30 pm at St. Athanasios Greek Orthodox Church, 51 Paramus Road, Paramus, NJ. Entombment will follow at George Washington Memorial Park in Paramus. Sending my deepest condolences to all of you. Keeping you all in my prayers. My sincere apologies to the Papalambro family, R.I.P. Nicholas!